Every school child learns about the two kinds of camels: one hump or two? That may not be possible in the future. The two-humped kind – the Bactrian camel – is classified as ‘critically endangered’, as a consequence of threats to its habitat on several fronts. Only a thousand individuals remain in their natural habitat in Asia and there is a chance that the wild Bactrian camel (Camelus bactrianus) may be extinct within fifty years. All camels are thought to descend from an animal very like the wild Bactrian; even the one-humped dromedary has two humps in the embryonic stages of development. The Bactrian camel now only survives in the wild in the vast Gobi Desert, and in only four regions: three in China and one in Mongolia. The principal area it has survived in is the Gashun Gobi, an area of desert that was used by the Chinese from 1955 to 1996 as its nuclear testing range. Today the area is the Arjin Sha Lop Nur Nature Sanctuary, proclaimed specifically with camel protection in mind. The wild Bactrian camel is uniquely adapted to the extreme arid conditions of the desert Gobi Desert, which averages less than 4 inches (100mm) rainfall per year. It is also resistant to freezing winter temperatures. Unlike domesticated Bactrian camels it has evolved the ability to drink salt water, and even salty slush when the oases are mere puddles. Despite this adaptability, its numbers are critically low. For animals already adapted to living in marginal areas such as deserts, global warming may be the last nail in the coffin. A longstanding drought in the Gobi has even further reduced the availability of water, while predators such as wolves congregate at the remaining oases, altering natural systems and patterns of predation. Ironically, the use of one of their natural habitats as a no-access missile-testing zone may have protected the Bactrian camel, which was already thought to have become extinct in the wild many years ago. Astonishingly, exposure to radiation does not seem to have affected them or their breeding. (Other creatures have perhaps not been so lucky.) However, hunting for food and sport, and habitat loss as land is turned over to support farm animals, has contributed to the continuing decline of an animal already on the edge. 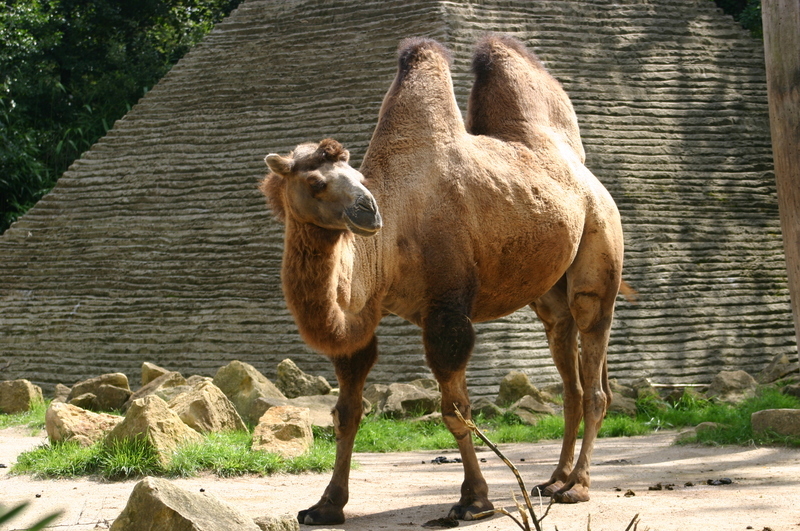 The unique adaptations of the Bactrian camel make it especially interesting for genetic studies, encouraged by the Wild Camel Protection Foundation. These camels have an extremely effective immune system and disease resistance, partly due to uniquely tiny antibodies. Genetic and immunological research may help in the development of new drugs for human and animal diseases. With captive breeding programmed and state protection, there may be some hope for the Bactrian camel. There are fears that the population numbers may already have reached a critical low, a point beyond which recovery is not possible. In the meantime scientists, activists and the governments of both China and Mongolia are working to save it from extinction.